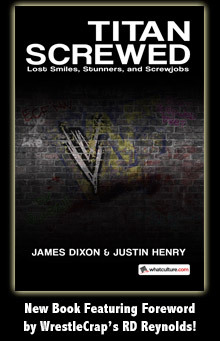 Headlies: Hulk Hogan Wants To Grace Cover Of Centrum Senior - WrestleCrap - The Very Worst of Pro Wrestling! Tampa, FL – As soon as Hulk Hogan saw the newest cover of his “Fruity Pebbles” box with John Cena on it, he knew it was time to jump back into the marketing game. Hogan wasn’t about to be one-upped by that no-good shill Cena! In the 1980’s, one couldn’t walk through Times Square without seeing a “Hulk Rules” t-shirt. People had their “Hulk Rules” foam fingers. They even put a “Hulk Rules” bandana on their dogs. Hulk had his own children’s vitamin line, filled with only the highest quality ICO-PRO ingredients. Unsourced rumors somewhat confirm that “Hulk Rules” urinal cakes sold out in three minutes. Hogan went into brainstorm mode to think about what he could be promoting these days. His mind kept saying, “you can do anything, brother”, but he knew it needed to be something huge. Before too long, Hulk’s housekeeper showed up with his hourly regimen of fiber pills and vitamin D. He choked them down as he always does, without water. Hulk can swallow anything except pride. Almost in slow motion, as the housekeeper walked away, Hulk noticed the Centrum Senior box sitting next to the Metamucil and the Activia. Fifty-five minutes elapsed before Hulk got to the edge of the bed and reached the phone to get his agent on the line. “My elephant has twenty ears?” Hulk asked. “No, I said you haven’t been relevant in twenty years,” his agent retorted. “I’m president of twenty steers?” Hulk guessed. Hogan then took his nap and forgot the entire conversation. 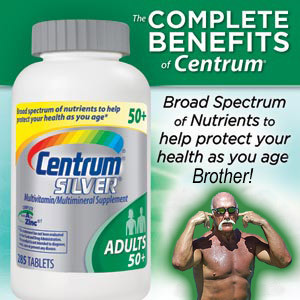 3 Responses to "Headlies: Hulk Hogan Wants To Grace Cover Of Centrum Senior"
I honestly wouldn’t be shocked if he’d take a deal to promote this, considering his age and financial situation. I know that Ric Flair wouldn’t turn up such a deal. Flair should shill for the little blue pill.